Remember back in 1996 when Mike Legg was playing for Michigan State, went behind the net, scooped the puck up on his stick and put it top shelf? Fast forward 10 years and Sidney Crosby does a perfect repeat of the Mike Legg goal. The question is, what should we call this move? The Crosby move, the Mike Legg goal, the Michigan move? I say we just break new ground and call it the scoopy puck move! Call it whatever you want, because we are not here to name the move, we are here to teach you how to do it. The Crosby move is a neat trick to do in practice, a skills competition, or even in a game! What you are doing is scooping the puck up onto the blade of your stick, and then throwing it at the net like a lacosse ball. The key to the Crosby move is to use centrifugal force. If you don’t know what centrifugal force is, just think of when you spin a bucket of water around and the water stays in. We want to use that same force to stick the puck to the blade of the stick. I have broken down how to do this in five simple steps. Lay the blade of your stick flat on top of the puck, leave a little bit of the blade hanging off of the back of the puck so you can apply pressure to the back of the puck and get it to tilt up. Now that the blade is in the right position you want to pull the puck back quickly but smoothly. Make sure the puck moves with the blade of your stick. Once you have the puck moving backwards you want to apply pressure to the back of the puck by pressing down on the bottom of the blade. Think of it as pinching the puck. This motion should get the puck up on the edge. Remember to move your stick with the puck. 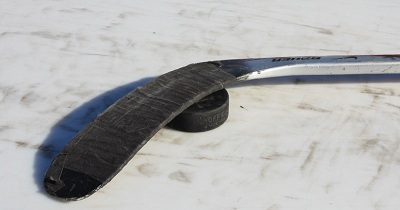 Throughout the entire move the blade of your stick will always be flat on the puck. Now that the puck is on edge you want to push forwards with the blade and begin to scoop the puck up. That’s it! Check out this video if you are still unsure of how to do the move. Mike Legg played for the University of Michigan not Michigan State. Great article! Could you maybe post an article showing how to do the Malik shootout move where he went between the legs? It’s an awesome move, but let’s not forget the crap that Don Cherry threw all over Crosby once he made it. I think he actually criticized him on HNIC saying that it was hot dog move, or something along those lines, and that the Remparts were going to hurt him for going against “the code”. Whatever, it WAS awesome and I think that if you’ve got the skills, use them. The ’05 draft wasn’t called the Sidney Crosby Sweepstakes for nothing. Thanks guys! I asked the HowtoHockey guys a month or so ago for a tutorial for this and they listened!!! When I first saw this move I thought it would be impossible to master… boy was i wrong a week and a halfs practice with this vid and now i can pull it off whenever i need to! Atta Boy! All it takes is practice (and maybe a good article and video 😀 ) and you can do anything you set your mind to. Great tip! I’ve always wanted to know how to do this move and I can’t wait to practice and get it down to an art. I noticed in the NHL official rules they refer to this as the “lacrosse-like move” (see Rule 25) I like to call it the “glue stick”. Whatever you call this move, it sure is slick.